A philosophy that saw self-possession as the key to an existence lived 'in accordance with nature', Stoicism called for the restraint of animal instincts and the severing of emotional ties. These beliefs were formulated by the Athenian followers of Zeno in the fourth century BC, but it was in Seneca (c. 4 BC- AD 65) that the Stoics found their most eloquent advocate. Stoicism, as expressed in the Letters, helped ease pagan Rome's transition to Christianity, for it upholds upright ethical ideals and extols virtuous living, as well as expressing disgust for the harsh treatment of slaves and the inhumane slaughters witnessed in the Roman arenas. Seneca's major contribution to a seemingly unsympathetic creed was to transform it into a powerfully moving and inspiring declaration of the dignity of the individual mind. Seeing self-possession as the key to an existence lived 'in accordance with nature', the Stoic philosophy called for the restraint of animal instincts and the importance of upright ethical ideals and virtuous living. I was recommended this edition of Seneca’s letters by a good friend, I didn't quite understand why until I began reading. I read a lot of self-help type books and this is probably the oldest version of that type of book I have ever come across! 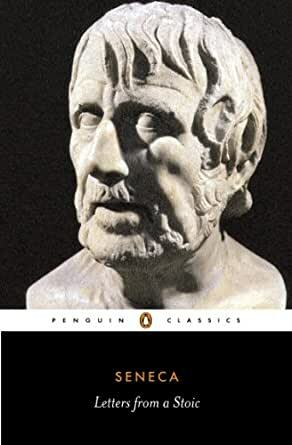 This edition includes every single one of Seneca’s epistles and the wisdom contained within these letters is brilliant. A worthy addition to any avid reader of self help. I got this book after hearing people rave about the Stoic philosophy. Seneca’s letters are witty and entertaining while also subtly outlining how to put the Stoic ideas into practical use. This is a book that I will keep forever. One of the best books I have read in ages. 5.0 out of 5 starsOld, yet new! I read Seneca's letters and found them very interesting. They teach how to live a happy life, despite the many sufferings people undergo. We find lots of wisdom hidden in them. There is always room to learn. This is a slick edition which reads better than some of the stodgier old translations. All three volumes are included. The unflattering review is not for Seneca or his letters but for the false advertising. Amazon indicates that the Kindle version is the Penguin edition with the Campbell translation. Not so. I returned my e-copy for a refund. "Each day acquire something which will help you to face poverty, or death, and other ills as well. After running over a lot of different thoughts, pick out one to be digested throughout the day." --------- I'm completely with Seneca on this point. I approach the study of philosophy primarily for self-transformation. There is no let-up in the various challenges life throws at us - what we can change is the level of wisdom we bring to facing our challenges. "It is not the man who has too little who is poor, but the one who hankers after more." ---------- This is the perennial philosophy from Aristotle to Epicurus to Epictetus to Buddha: we have to face up to our predicament as humans; we are in the realm of desire. The goal of living as a philosopher is to deal with our desires in such a way that we can maintain our tranquility and joy. "But if you are looking on anyone as a friend when you do not trust him (or her) as you trust yourself, you are making a grave mistake, and have failed to grasp sufficiently the full force of true friendship." --------- Friendship was one key idea in the ancient world that modern philosophy seems to have forgotten. Seneca outlines how we must first test and judge people we consider as possible friends, but once we become friends with someone, then an abiding and complete trust is required. "The very name of philosophy however modest the manner in which it is pursued, is unpopular enough as it is: imagine what the reaction would be if we started dissociating ourselves from the conventions of society. Inwardly everything should be different but our outward face should conform with the crowd. Our clothes should not be gaudy, yet they should now be dowdy either. . . . Let our aim be a way of life not diametrically opposed to, but better than that of the mob.". ---------- The call of true philosophy isn't an outward display but an internal attitude. There is a long, noble tradition of living the life of a philosopher going back to ancient Greece and Rome, that has, unfortunately, been mostly lost to us in the West. It is time to reclaim our true heritage. "You may be banished to the end of the earth, and yet in whatever outlandish corner of the world you may find yourself stationed, you will find that place, whatever it may be like, a hospitable home. Where you arrive does not matter so much as what sort of person you are when you arrive there." -------- This is the ultimate Stoic worldview: our strength of character is more important that the particular life situation we find ourselves in. Very applicable in our modern world; although, chances are we will not be banished to another country, many of us will one day be banished to a nursing home. "This rapidity of utterance recalls a person running down a slope and unable to stop where he meant to, being carried on instead a lot farther than he intended, at the mercy of his body's momentum; it is out of control, and unbecoming to philosophy, which should be placing her words, not throwing them around." --------- The ancient world had many people who talked a mile a minute, an unending gush of chatter. The Greco-Roman philosophers such as Seneca and Plutarch warn against garrulousness. Rather, we should mark our words well. From my own experience, when I hear long-winded pontifications, I feel like running away. "The next thing I knew the book itself had charmed me into a deeper reading of it there and then. . . . It was so enjoyable that I found myself held and drawn on until I ended up having read it right through to the end without a break. All the time the sunshine was inviting me out, hunger prompting me to eat, the weather threatening to break, but I gulped it all down in one sitting." --------- Ah, the experience of being pulled into a good book! When we come upon such a book, go with it! 58 people found this helpful. 5.0 out of 5 starsA must read, but I warn you. Simple practical wisdom to help you navigate chaotic life. There are so many jewels in this book that I've probably highland more things than I have not. I simply cannot recall the last work of literature that turned on as many lightbulbs for me except perhaps the bible when I first read it. This wisdom though transcends religion in my humble opinion. A must read, but I warn you; the wisdom and enlightenment you gain from reading Seneca's letters will only further estrange you form your dumb friends. They won't get it or your interest in it, and as they continue to fumble about in the dark, the sweetness of your metaphysical ascension will mingle with some bitterness for their blindness. *It is not the man who has too little who is poor, but the one who hankers after more. *You ask what is the proper limit to a person's wealth? First, having what is essential, and second having what is enough. *Although the wise man does not hanker after what he has lost, he does prefer not lose them. *The qualities of a just, a good and an enlightened character does not regard as valuable anything that can be taken away. *I am not against possessing riches but I want to ensure that you possess them without tremors. *Inwardly everything should be different but our outward face should conform to the crowd. *The road is long if one poceeds by way of precepts but short and effectual if by way of personal example. *You ask me to say what you should consider it particularly important to avoid. My answer is this: a mass crowd. *Associating with people in large numbers is actually harmful. *Retire into yourself as much as you can. Associate with people who are likely to improve you. *Avoid whatever is approved of by the mob. *If you shape your life according to nature, you will never be poor; if according to people's opinions you will never be rich. *Pick (any exercise) for ease and straightforwardness...but whatever you do, return from body to mind very soon. *Where you arrive does not matter so much as what sort of person you are when you arrive there. *A way of speaking which is restrained, not bold, suits a wise man in the same way as an unassuming sort of walk does. *Refusal to be influenced by one's body assure one's freedom. *People who know no self-restraint lead stormy and disordered lives. *Every day, therefore, should be regulated as if it were the one that brings up the rear, the one that rounds out and completes our lives. *If God adds the morrow we should accept it joyfully. *The man you should admire and imitate is the one who finds it a joy to live and in spite of that is not reluctant to die. *You will go the way that all things go...This is the law to which you were born. *You will die not because you are sick but because you are alive...In getting well again you may be escaping some ill health but not death. *We are born unequal, we die equal. *It molds and builds the personality, orders one's life, regulates one's conduct, shows one what one should do and what should leave undone, sits at the helm and keeps one on the course as one is tossed about in perilous seas. *Only philosophy will wake us; only philosophy will shake us out of that heavy sleep. Devote yourself entirely to her. *For the only safe harbor in this life's tossing, troubled sea is to refuse to be bothered about what the future will bring and to stand ready and confident, squaring the breast to take without skulking or flinching whatever fortune hurls at us. *It is in not man's power to have whatever he wants; but he has it in his power not to wish for what he hasn't got. *Part of the blame lies on the teachers of philosophy, who today teach us how to argue instead of how to live...The result has been the transformation of philosophy, the study of wisdom, into philology, the study of words. *No man is good by accident, virtue has to be learned. By the way, before renouncing all worldly possessions keep in mind that Seneca did not practice what he preached, was intimately attached to the material world, and readers interested in an excellent biography of Seneca's life and role during Nero's reign should consider reading James Romm's "Dying Every Day: Seneca at the Court of Nero." 5.0 out of 5 starsThe original self-help book. This is a book that I keep next to my bed, and when I take trips it goes in my suitcase. I've given this book away several times and plan to give it away more, but I always buy a new one. Sometimes it's like looking into the mirror of western civilization, others it's like looking at our cultural family tree, but most of the time it's a book that consoles me and offers new perspectives no matter what I'm dealing with in life. On my shelf this book is next to the Bible, the Tao Te Ching, and Stephen King. It's also a book I've read passages aloud to my younger siblings during a day in the park -- that was no easy task -- but they were held captive by the introspection this book helps to trigger.